Charney Research » After the Arab Spring: Democratic Consolidation in Tunisia’s Elections? After the Arab Spring: Democratic Consolidation in Tunisia’s Elections? Tunisia has been touted, rightly, as the Arab Spring’s success story — but questions still hover over the country where the revolts against Middle Eastern dictators began. After three years of struggle and crises, North Africa’s most developed country has a consensus constitution and a caretaker government steering it to its second democratic election. Yet this means the country now faces the acid test for the consolidation of a new democracy: will it establish meaningful electoral competition and the alternation of power? Polls suggest Tunisia may pass this test, voting in a liberal leadership after first electing an Islamist government following the country’s revolution. If so, it may again be a pace-setter, proving there is an alternative to the renewed dictatorship or chaos prevailing in other states touched by the Arab Spring. But success is no sure thing — and defeat for the liberals may reveal another dead end for Arab democracy, with the opposition again mere appendages of a dominant ruling party. Tunisia has made important democratic advances since President Zine el Abedine ben Ali fell in December 2010, passing stumbling-blocks which stalled or derailed transitions elsewhere in the Arab world. After false starts, intense debate, and big public protests, Islamist and secular deputies to a constituent assembly agreed on a secular, democratic state structure in which religion’s role is circumscribed and equal rights for women guaranteed. Moreover, as rising violence and a sinking economy bred public disillusion, the transitional government, led by the Islamist Nahda party, agreed to step down at the constitution’s adoption. Instead, a technocratic cabinet will rule until the vote, as the secular opposition had demanded. A crucial mediating role in negotiating these accords was played by labor, business, and human rights groups in a country where civil society is the Arab world’s strongest. In response, the national mood has brightened. Non-party Prime Minister Medhi Jomaa’s job approval rating was 47% in a February 2014 poll, nearly twice his Nahda predecessor’s. The constitutional pact also yielded a 10-point jump in optimism about Tunisia’s economic prospects, to 45%, and boosted optimism about the country’s future to 81%. The contrast between Tunisia and other countries where regimes were toppled or shaken by the Arab Spring is stark. In Egypt, an elected Islamist government rammed through a constitution rejected by secularists and responded to growing discontent with repression until overthrown by the military last July. In Yemen, endless constitutional talks plod on. Syria’s civil war has become a byword for brutal conflict between sects and ideologies. But perhaps the biggest difference between Tunisia and those countries is the rise of a substantial secular party, with potential to effectively oppose Islamists at the ballot box. 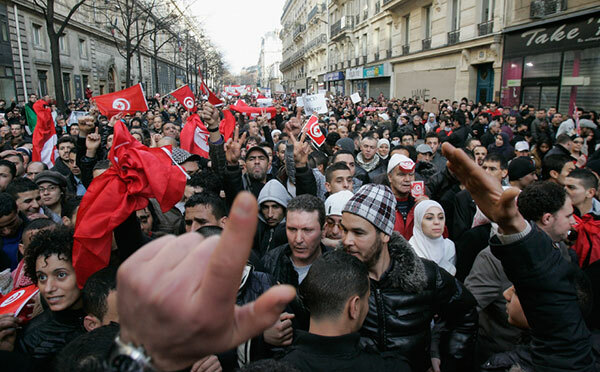 Nidaa Tounes, the “Call of Tunisia,” a self-described “modernist” party, rallies liberals, leftists, and ex-supporters of Ben Ali and his predecessor, Habib Bourgiba, Tunisia’s first president. It was founded in 2012 by 86-year-old Beji Caid Elsebsi, a long-time liberal politician and the first post-revolutionary Prime Minister. Nidaa Tounes has led Nahda in opinion polls for the past year, and Elsebsi also leads in the race for president. While the “green tide” that propelled Islamists to the fore in the wake of the Arab spring has receded, nowhere else has seen the emergence of such a strong secular opposition. Still, this year’s election offers Tunisia the possibility of another “first”: the first democratic transfer of power in the region from one elected government to another since the Arab Spring. Genuine electoral competition resulting in alternation of power is recognized as the mainspring of democracy. If Tunisia can attain this, its prospect of becoming the Arab World’s first real democracy will be bright. IF not, the hopes awakened by its revolution may fade, as single-party rule is revived in thinly disguised form.